update Jan. 2011: a post on its application in relief work in places like Haiti here. I've talked about this idea before. Then I found out about the Hesco wall shelter. 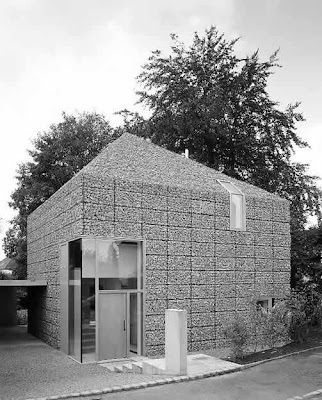 But a German architect did it, a house covered in gabions. Materialicious had the pictures. Treehugger still does. The website is all in German so I'll need my wife to interpret, but he does have pictures here. More pictures on another blog here, scroll to bottom, with this insight. Weighing around 80 kg each, the baskets can be removed individually. This enormous mass (40tonnes) has a buffer effect in winter and summer. No external guttering was allowed to detract from the sculptural effect – rainwater flows instead down a waterproof membrane behind the layer of stones. The thing I would do differently is allow all sorts of greenery to grow up the walls. Now that would be sweet.